Earlier this week, Chasm, the years-in-development action-adventure platformer inspired by games like Super Castlevania IV, finally got a release window of summer 2018. Below got similar news last month when its developers announced that the long-awaited roguelike would be out before the end of the year. It’s been a long road for both games, but one their designers say was worth taking. The first time I saw both games was at PAX East in April 2014. Both demos left me enthralled and, as demos sometimes do, seemed indicative of games well on their way to being complete. They handled well. The art looked beautiful. Even the ambiance was there, brooding and threatening in Below’s case and vibrantly retro in Chasm’s. It turns out neither game was near being complete at the time, which is why, four years later, both are being shown off at PAX East again this week with the goal of coming out by the end of 2018. Both Chasm and Below have similar subject matter—fighting monsters in dark, underground places—and have encountered familiar obstacles on their journeys to release. Both games outgrew their original scope, and while serial delays can occasionally signal fatal flaws (see: Duke Nukem Forever), with these two games the developers say it was about taking the time to get things right. That pressure started after Below was announced at Microsoft’s E3 2013 showcase. Indie Game: The Movie, documenting the development of Super Meat Boy and Fez, had come out a year earlier, and Below looked like it would be part of the next batch of indie darlings, exuding the feel of Limbo but with swords. Below made the rounds at conventions in 2014 with a release planned for 2015, but that never happened. At the Game Developers Conference in March 2016, Piotrowski admitted that putting the finishing touches on the game was easier said than done. “The game was like 100 times bigger and more complex than we anticipated,” he told Engadget at the time. Still, the studio announced Below was on track to release that summer. That never happened either. In a cryptic blog post on the studio’s website in August 2016, the team said it wouldn’t be hitting its new target and would be going dark instead. “From the very beginning, Below has been our most ambitious undertaking, and we’re just not quite done excavating its depths, or polishing all of its facets,” the studio said. It was a big blow to fans, and a surprising move given how bullish the team had seemed just months earlier. While the game’s look, a more fleshed out version of the studio’s second breakout hit, Superbrothers: Sword & Sworcery EP, remains intact, Vella says they’ve added new creatures, designed new mechanics, and overhauled many of Below’s systems. The game now has a light and dark mechanic based around a lantern whose lore has been etched into the story and didn’t exist in earlier builds. The world also went from being approximately 90% 2D to 90% 3D, Vella said. As things like lighting became a bigger focus, spaces went from being flat to having depth and more complex visual effects. Over the past couple years, Capybara effectively remade Below. The game also uses procedural generation. Unlike the original Zelda and other games that influenced it, which all had fixed level designs, Below’s world is constantly being remixed by algorithms to create slightly different versions so that no playthrough is the same. “We had a version of the procedural generation of levels completed early but we weren’t happy with it and then ended up redoing it a bunch of times,” he said. The team realized that true randomness, like what you get from a series of dice rolls, doesn’t actually end up feeling random when done on a large scale. Rather than very unique outcomes, you get lots of things in the middle of the spectrum that all start to average out. “Total randomness doesn’t feel good, or even feel random. It just feels messy and crummy,” he said. Vella says one main reason for all the delays was that the game’s core premise changed. What started as a dungeon crawler with permadeath is now much more explicitly a game about managing survival—where hunger and cold can be as deadly as bloodsucking bats. “We like to think about it as this strangely beautiful procedural terrarium that you’re staring into and it’s really about living and dying and surviving and discovering, that’s stayed very similar.“ he said. Throughout 2017, the team didn’t show Below to the public outside of a brief appearance at the San Francisco-based event Day of the Devs near the end of the year. Now, Capybara is revealing the new version to fans at PAX East. If everything goes as expected, the game will ship some time around the end of the year, right after Vella’s son turns two.. “When we set out to make the game, we wanted it to be original in some way, to be an experience in some way, that’s what we think Capy games are—beautiful little experiences even though Below is actually a pretty big experience,” Vella said. is a different beast and its development has followed a different path. The demo that appeared at PAX East in 2014 was a much more polished version of the prototype the studio behind the game, Bit Kid (formerly Discord Games), had shown in its original 2013 Kickstarter pitch, which was cobbled together with the programming equivalent of duct tape according to its director, James Petruzzi. It was also enough to convince Sony to feature the game prominently at its conferences and in kiosks marketing the PS4, and yet it was far from a complete game. Beyond the beautiful pixel art, the major draw of Chasm are its random maps. While it looks and plays much like the Metroidvania games of old, where it breaks from that formula is in trying to generate each map randomly. While the broad outlines of individual rooms are crafted by the team, their contents are procedurally generated, as is the overall layout connecting them. Just like with Below, this helped add to the mystery and exploration of the game, but it also ended up being a pain to code. “There were several times we were just kicking ourselves like, ‘Why did we make this procedurally generated,’” Petruzzi said. “We could have had so much more done by now if we’d just made the stuff.” Where procedural generation is a natural fit for games like Minecraft, a game about the weird stuff that happens in-between building things, it’s harder to make work in games that have a story. “In something like Chasm, or Below from what I’ve seen, you’re trying to tell this story and have this growth of the player and the mechanics and see these things build as the game continues,” he said, and procedural generation can easily turn that into a “spaghetti mess” if not done well. While power-ups and boss fights always flow in the same order in Chasm, the moment to moment experiences are meant to be different for each player, and in the end, it turned out there wasn’t a shortcut for creating that. The feeling of a random adventure still had to be manually constructed, down to the sliders controlling which procedurally generated elements populate which areas of the game at what rates. These lessons might not have been news to seasoned veterans in the field, but for Petruzzi and the small team of designers and freelance artists at Bit Kid who were embarking on their first real game, it was like going to school for a masters in SNES-era adventure platformers while also trying to ship one. Petruzzi originally conceived of the game back in 2012 on his honeymoon. The Kickstarter launched in April the next year and earned $191,897 of a $150,000 goal with a projected ship date of May 2014. With no finished product in sight by June 2017, the studio posted an update to the Kickstarter apologizing to backers for how long everything was taking. When putting the game’s six year development arc in perspective, Dan Adelman, who used to run Nintendo of America’s indie program but now works as an independent consultant, including on Chasm, fell back on a famous Shigeru Miyamoto quote. “A delayed game is eventually good, but a rushed game is forever bad,” the creator of Mario said back when defending the long wait for the N64. “I think that has been the development mantra,” Adelman told me during a phone call. While the studio’s timeline for completing the game was clearly impractical, Petruzzi says he has no any regrets about when and how the game was revealed. 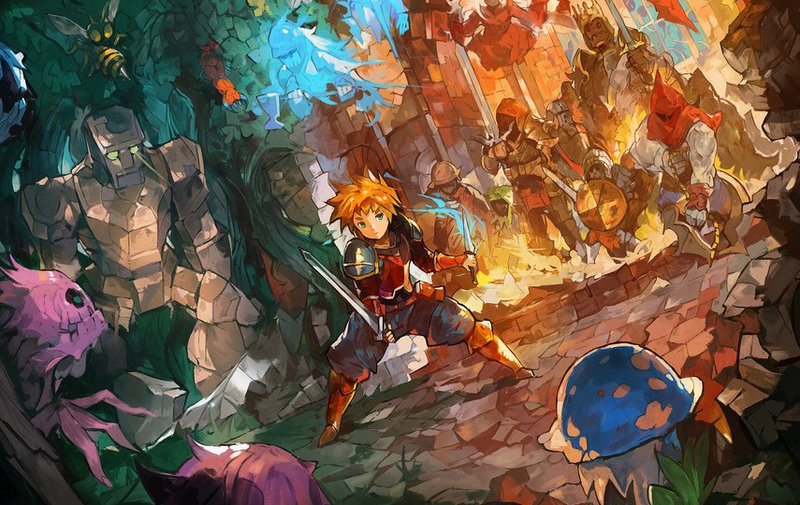 “Had we not talked about it when we did, Chasm would never have gotten made,” he wrote in the PlayStation Blog post announcing the summer 2018 release window for the PC, PS4, and Vita versions of the game. “The game exists thanks to the financial and emotional support of those early fans, and we are eternally grateful.” Delaying a game several years isn’t ideal, but in Chasm’s case, the funding and publicity provided by companies like Sony might never have been there if Petruzzi and the rest of the team hadn’t taken the leap on a half-finished prototype. Time will tell if the wait for both of these games has been worth it. Not everything gets better with age. The market for games, especially small ones that come to light on the strength of a trailer or highly-stylized aesthetic, has also changed a lot in the last four years. It’s possible that in taking the time to make their games that much better, they’ll have missed their moment. Neither Petruzzi or Vella seemed worried about that when I spoke with them. Instead of trying to game the marketing cycle, both seem to care more about delivering on their promises to fans. At GDC 2010, game designer Chris Hecker delivered a rant about the need for more games that explored their subject matter and mechanics in-depth rather than shallow experiences that shipped on time. Tons of games come out every day. Many aren’t very good. Most are quickly forgotten. “It doesn’t matter if you can make a game in two days or one hour or 14 minutes or six years,” he said at the end of the speech. “It matters that you make the game the game it should be.” Hecker’s own game, SpyParty, has been in development for 10 years and is finally set to hit Early Access on Steam on April 12. “I spent a bunch of time at GDC with Chris Hecker talking about SpyParty and games that have been in development for a long time,” Vella said at the end of our interview. “I feel like they come out in batches. This year there’s a batch which is super interesting.” We’ll know in the coming months whether Chasm and Below are both a part of it.